Sept. 17, 2018-- High School North freshman Julietta Onofrietti was named to the Top 300 of 2,537 applicants for the Broadcom MASTERS Science Fair. As the only middle school STEM competition-- Julietta entered with the Intermediate North Science Fair Project last year-- that leverages Society-affiliated science fairs as a critical component of the STEM talent pipeline, the Broadcom MASTERS consists of the top 10 percent of 6th, 7th and 8th grade projects entered in Society-affiliated fairs around the country. Julietta's project: Can Plant Derived Oils Act as a Natural Way to Decrease Caries Causing Bacteria Streptococcus mutans in the Oral Cavity? According to Broadcom MASTERS, only 34 students selected for the Science Fair were from New Jersey this year, and only three from NJ were tapped as Masters 300 National Finalists. One in Titusville, one in Princeton, and Julietta in Toms River. The full press release announcement, including a link to students' names and a state-by-state breakdown, can be found here. The Top 300 MASTERS hail from 224 middle schools in 35 states and represent 120 regional and state science fairs across the U.S.
78 are from California, followed by Florida with 33, Texas with 21, Pennsylvania with 18, and Oregon with 12. The Society and Broadcom Foundation are proud of the record breaking 2,537 students who completed the 2018 application. 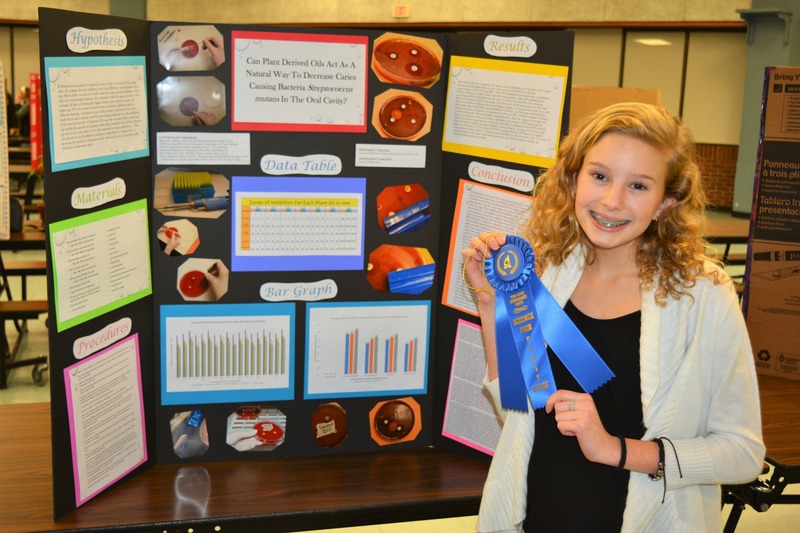 Entrants came from more than 6,000 nominees, representing the top 10% of science fair projects nationwide. Each application received three independent readings and evaluations by distinguished scientists, engineers and educators. Nominees qualified to enter the Broadcom MASTERS by being among the top 10 percent of the participants at their Society-affiliated science fairs. Broadcom Foundation and Society for Science & the Public (the Society) are proud to announce the selection of 300 students as the Top 300 MASTERS in the eight annual Broadcom MASTERS®– the nation’s most prestigious Science, Technology, Engineering and Math (STEM) competition for middle school students. The top 300 MASTERS include more females than males with 152 girls and 145 boys selected from a record 2,537 applicants. Julietta Onofrietti poses next to her Science Fair project, which was submitted when she was an eighth grader at Intermediate North, where she learned from her teacher, Mrs. Klimack, as well as Mrs. Keller, who runs the Science Fair at IN.